Butter four slices of bread and coat with butter and honey. Coat the remaining four slices with butter and Marmalade jam. Lay the honey-covered slices into an ovenproof dish and cover with sultanas, currants, chopped cherries and chocolate chips. 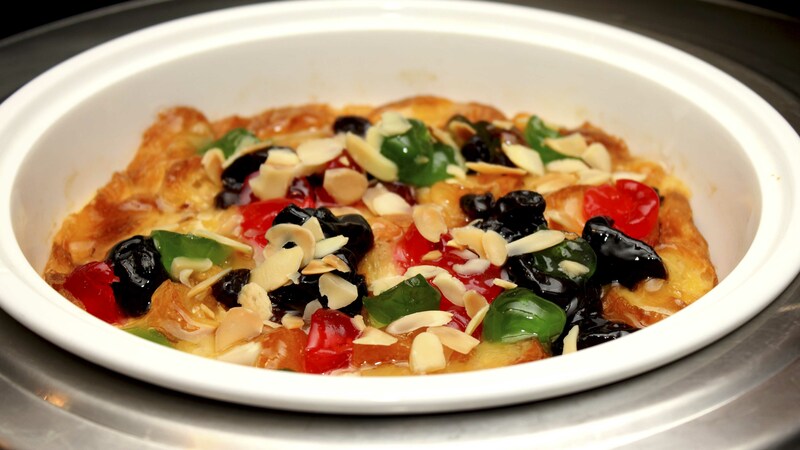 Lay the jam-covered slices of bread on top and then sprinkle with another good handful of sultanas and currants. Beat the eggs with the sugar. Bring the milk to the boil and gradually add this to the eggs and sugar mixture. Whisk thoroughly, adding the cinnamon, and then pour the mixture over the bread and fruit. Leave the mixture to soak into the bread for about 10 minutes. Add the Prosecco if cooking the adult version. Cover the dish in tin foil and place in the wood-fired oven. Cook at approximately for about 20 minutes uncover brown and remove from oven add more chocolate chips and cherries and serve. Remove the foil and cook for a further 2-3 minutes. Remove the dish before the fruit on the top is burnt. Serve with vanilla ice cream, cream or warm custard.